Indian Navy invites applications for the post of sailor MR Musician 02 2017 Batch from unmarried male candidates. 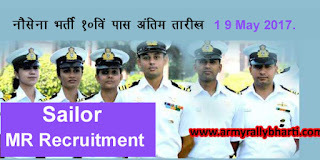 Candidates who are 10th pass and want to join Indian navy, this is the best opportunity for them. Candidates must have practical skill on any musical instrument of Indian or foreign origin. Education Qualification :- 10th pass or Matriculation examination. Age limit :- Candidates born between 01 Oct 1996 to 30 Sep 2000 are illegible to join Indian Navy as 10th pass sailor. Musical Ability :- Candidates will be selected on Merit basic only. Candidates should have knowledge of Theory of Music including staff Notation. (a) Application will be received only through ORDINARY POST. Application received through speed post/ registered post or couriers will be rejected. (b) All original certificates and mark sheets are to be produced at the time of screening. (c) Preliminary selection, PFT and Medical Examination, may take 3-4 days. will not be enrolled for training. No “appeal” is permitted for review after the final enrolment Medical at INHS Asvini. (e) The candidates who qualify in all respects will be short listed for Final screening depending upon the vacancies. Candidates selected in the Final Screening will be send to INS Chilka for training. (f) The candidate’s selection pertaining to a particular batch is valid for that batch only. Qualified candidates whose names do not appear in the final select list cannot claim admission in the next batch. These candidates will have to undergo the selection procedure afresh provided that they meet the eligibility criteria for the fresh batch. Last date of receipt of application - 1 9 May 2017.